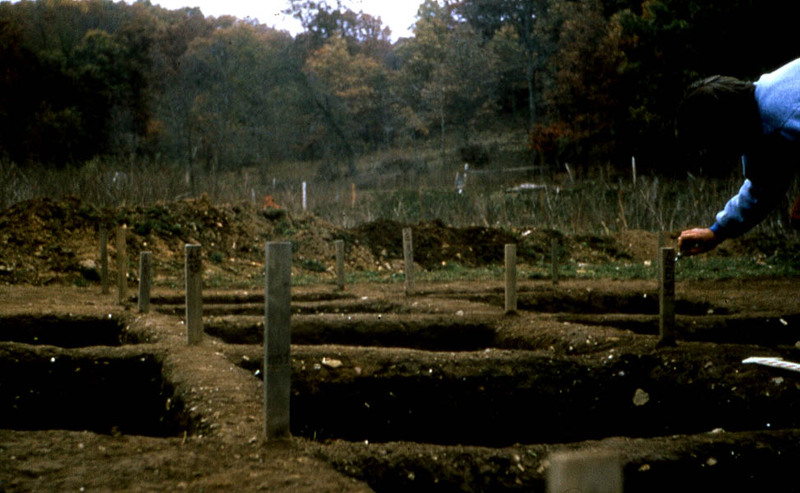 The Patterson Spring site (23CN64) is situated in the James River Drainage near Springfield, Missouri. 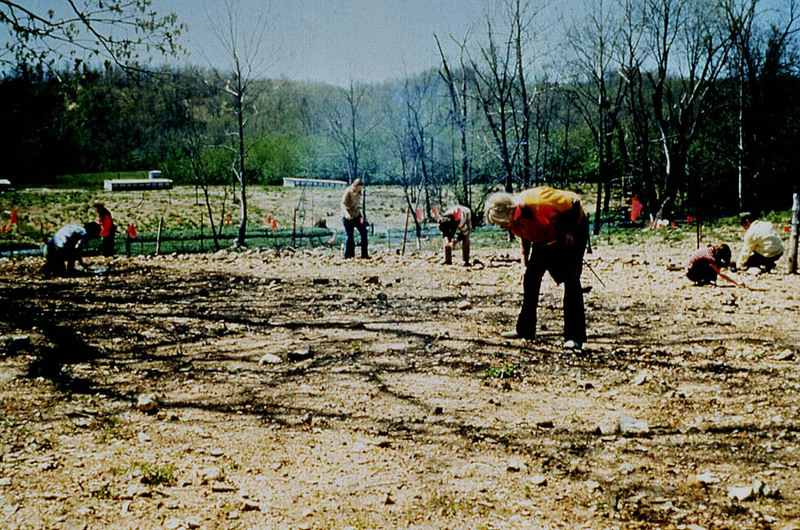 Field crews of amateur archaeologists and students from Missouri State University conducted controlled surface surveys and excavation of the site during the 1970s. 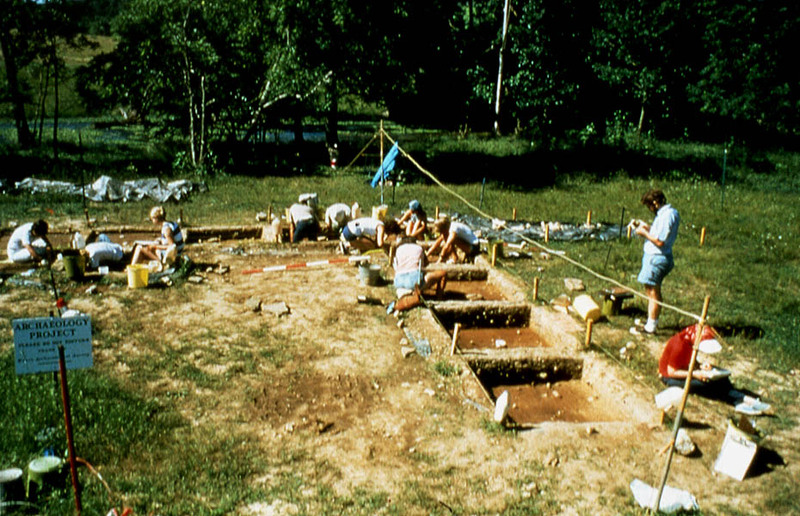 The work was directed by Betty Jane Turner and Jeep Helm (members of the Ozarks Chapter of the Missouri Archaeological Society and research associates with the Center for Archaeological Research at MSU). The site had been used as a pig farm for several years resulting in severe erosion. The site is located on private property and is not open to visitors. The first phase of fieldwork at the site was a controlled surface survey where all artifacts were flagged and mapped before being collected. Pig sheds are seen in the background. 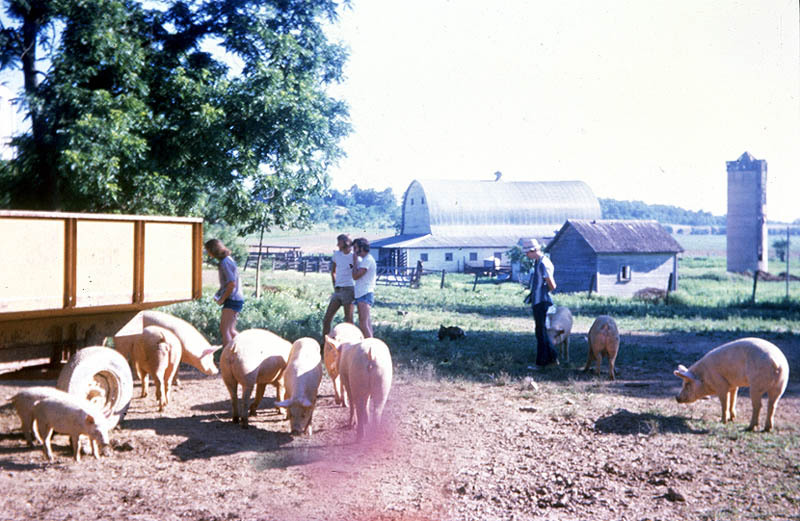 Student archaeologists participating in the James River Archaeological Project (Youthgrant NEH project directed by Michael Fuller at MSU) examine the Patterson Spring site with assistance of pigs! Archaeologists (right to left) Mike Gilmore, Stan Meyer, Rodney (? ), Roberta Wilson. Student archaeologists working at an MSU fieldschool at 23CN64; Michael Fuller, standing right, is taking notes and photographs. 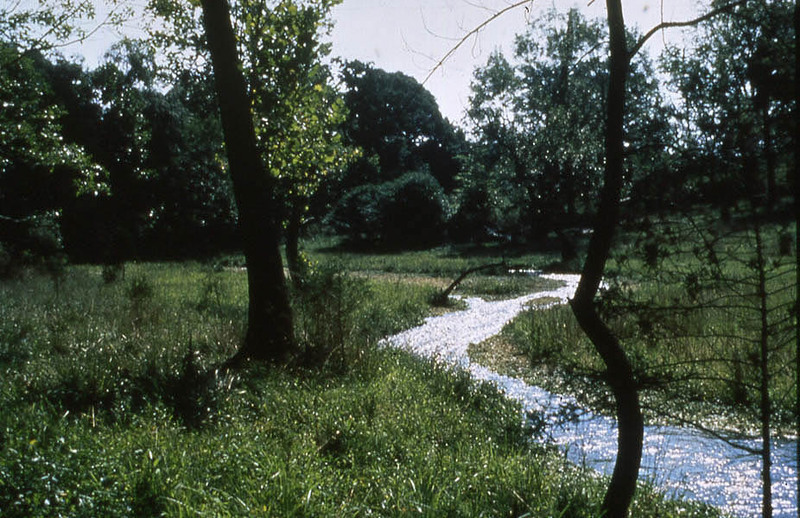 Patterson Spring flows through the heart of the site. 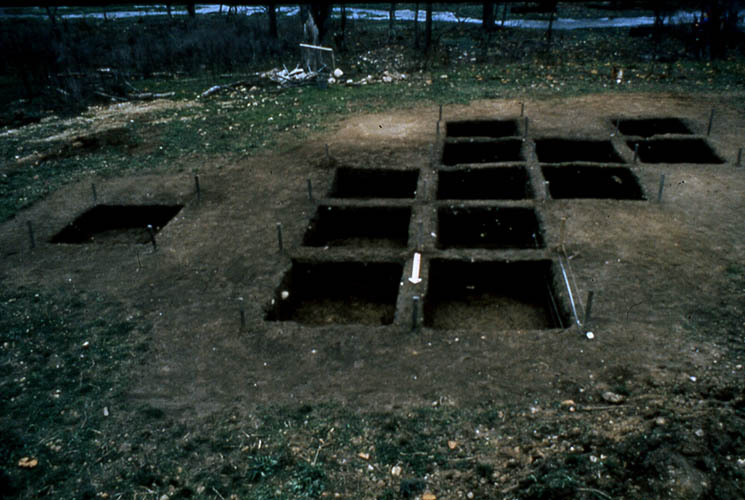 Patterson Spring site excavation units. 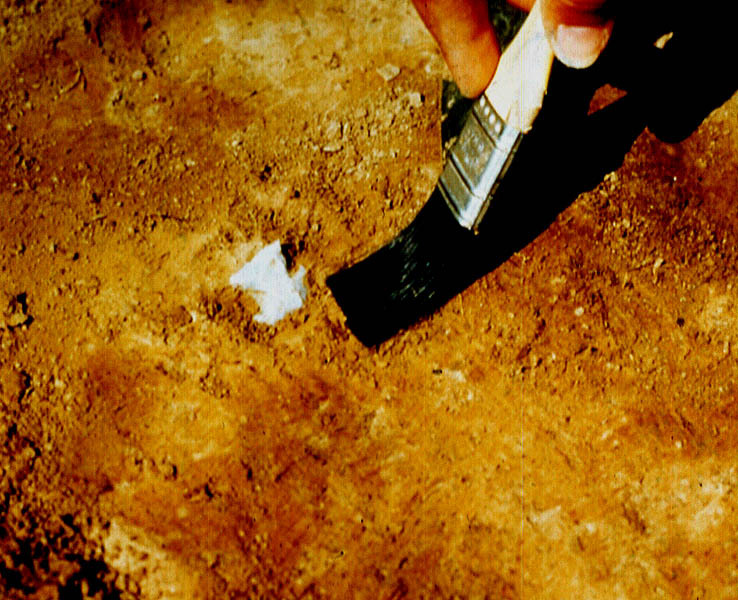 Soil was excavated in arbitrary layers during the excavation because there were no distinguishing color or texture changes in the soil. Each arbitrary excavation layer was 6 inches deep. 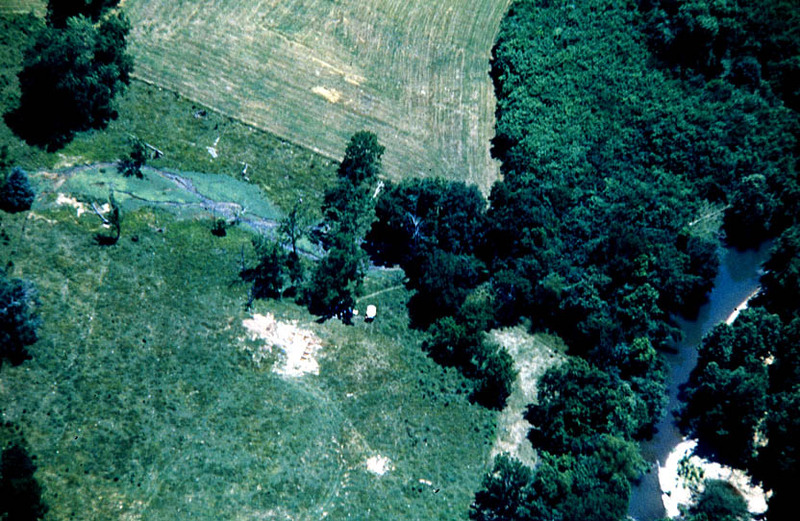 Aerial photograph of the site taken by Michael Fuller showing excavation units, a Toyota jeep, and the relationship of the spring branch to the nearby river. 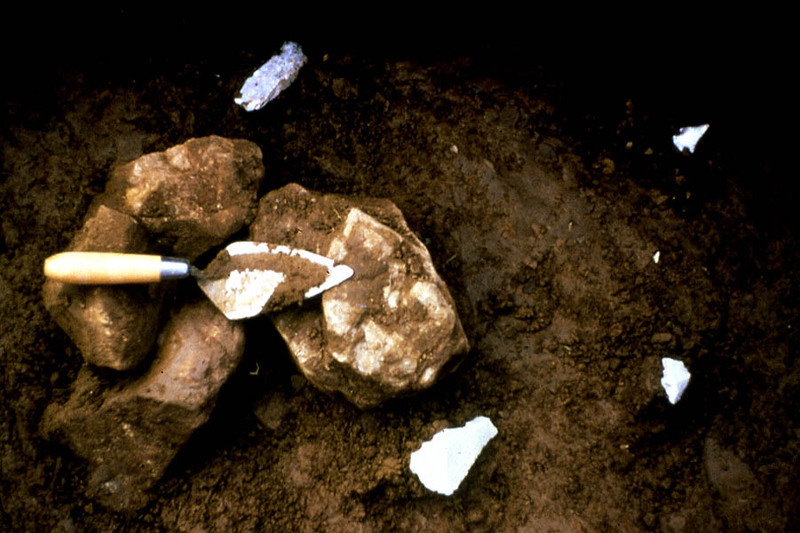 Human skull fragments in situ during excavation and view of excavation units. Nearby was a snapped clay pipe, a pottery sherd, and a groundstone celt. 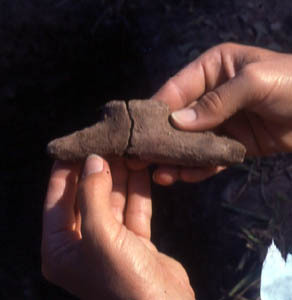 Two pieces of the snapped clay pipe on the day of discovery in 1975. 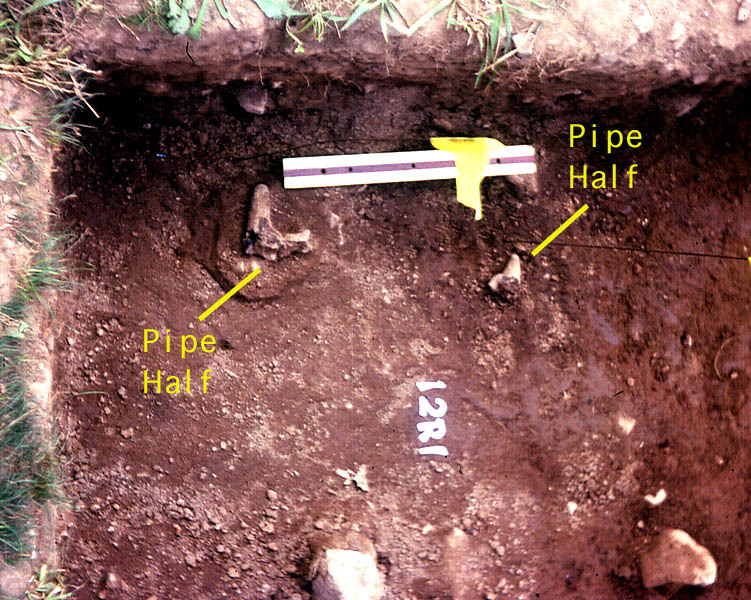 Clay pipe found in situ during excavation. January, 1975. Woodland Period pipe pieces. The excavators consider it to be a Middle Woodland Period pipe. 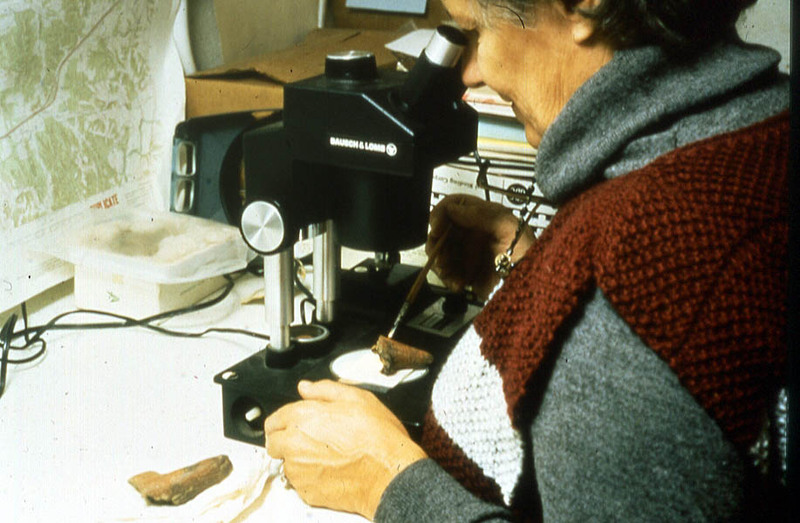 Patsy Corbett cleaning and conserving the pipe fragments. Rimsherd that was uncovered in situ near the snapped clay pipe. Drill holes along the edge of the sherd were probably for suspension (using a cord) and not the result of mending. Three arrowpoints from 23CN64. The point to the left is from a black chert, probably Pitkin chert, from Arkansas. The central point is a serrated scallorn point. 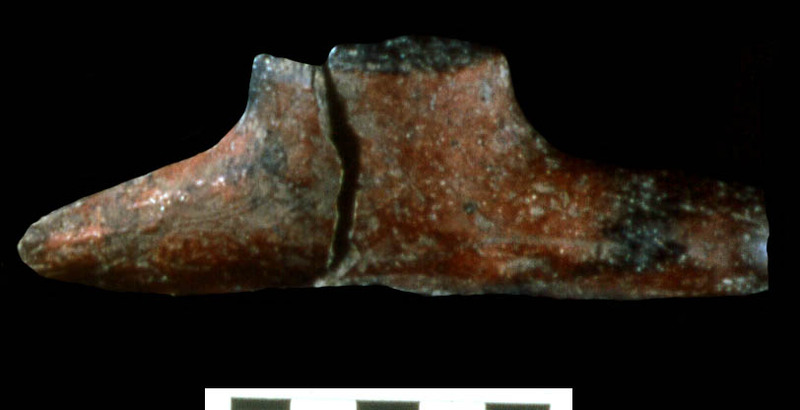 The point to the right is a Naylor point manufactured out of a flake without extensive retouch. These points are either Emergent Mississippian or Late Woodland points. 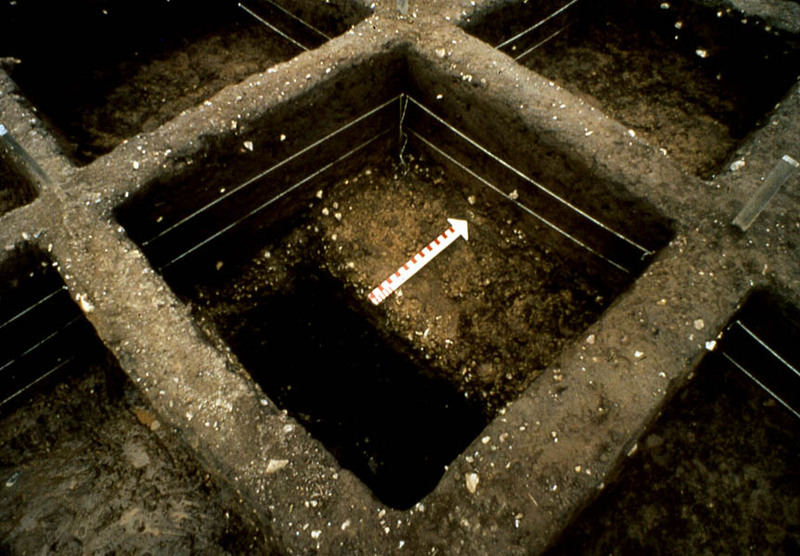 Archaic point in situ at 23CN64. 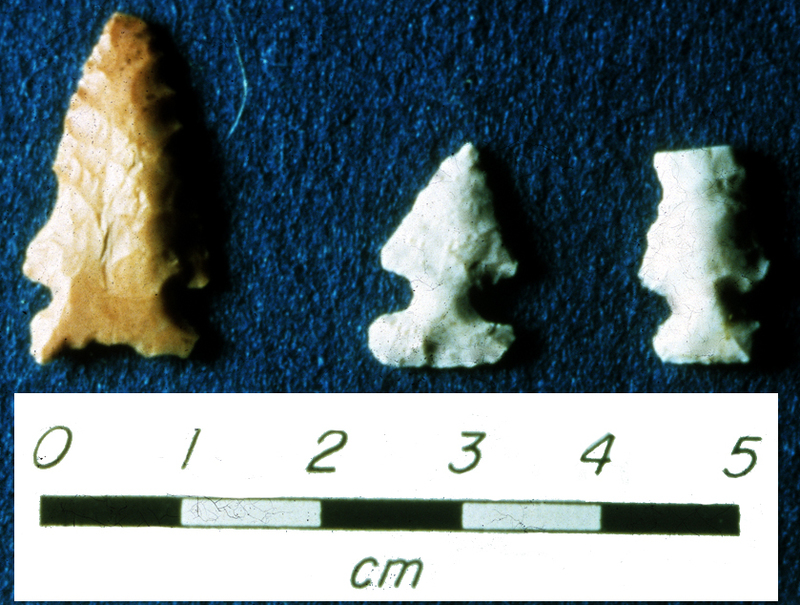 Late Woodland projectile points, preforms, and debitage. 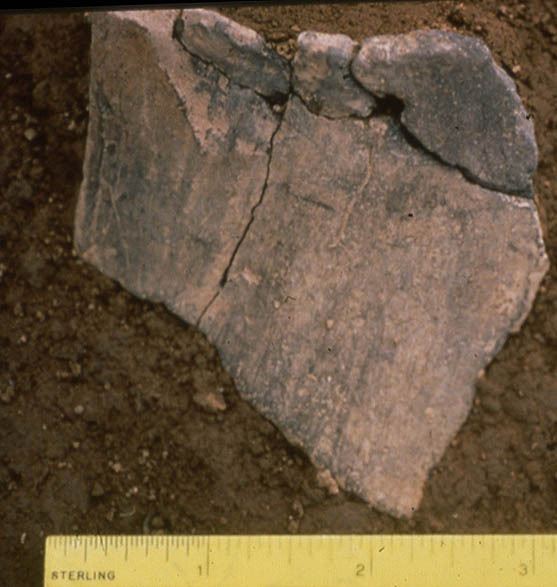 One of the most fascinating discoveries at the site was a discrete feature containing hundreds of trimming flakes, waste flakes, blades, and an exhausted core. It appeared to be the result of a single episode of flintknapping. Small arrowpoints from the Patternson Spring Site.